AdminCentralForums.com is a forum dedicated to all of you admins. We have coding, promotions, tips and trick and allot more. We are turning into a forum to teach you how to develop you community, where to advertise and How to get and keep members. Today marks the start of the Posting Competition (see announcements) We are hoping this will revive the forum a bit and help activity. SOme great Prizes are being given away in 2 weeks like, domains, hosting, special advertisements and maybe even more. Check us out join and post around, it only takes a few moments and you might even like the forum. I generally like your design, but I think the header is WAY too tall. When you are on a showthread page, almost 70% of the 'above the fold' space is taken up with non-content. 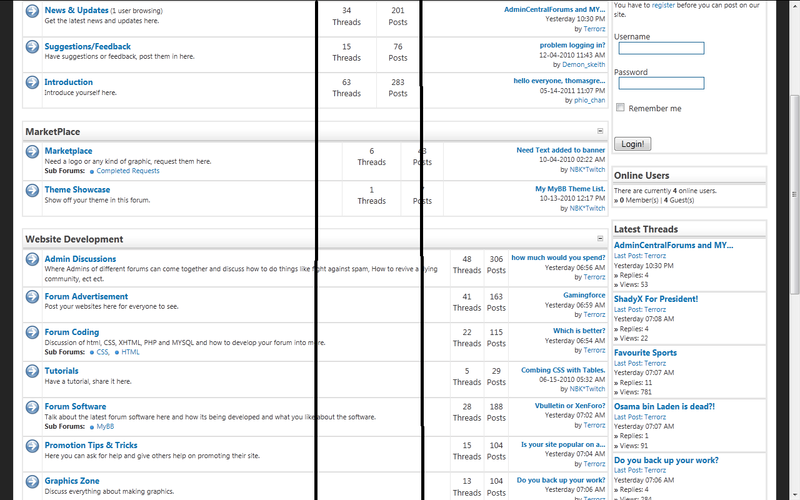 Also, I think the forum listings are way too wide. I think if you were to add a sidebar on the index page, your layout would seem much more professional. Good starting content and an overall good job. (05-14-2011, 04:07 AM)Kodaks Wrote: [ -> ] I generally like your design, but I think the header is WAY too tall. When you are on a showthread page, almost 70% of the 'above the fold' space is taken up with non-content. I edited the theme to make it smaller. Yeah, I set the width of the forum wide because I was going to add the side menu, I just got sleepy before working on it and went to bed. I don't like you theme. I also don't like how that's not even. (05-15-2011, 05:17 PM)Richard Wrote: [ -> ] I don't like you theme. Just noticed it. yeah! It should be corrected.